Two mannikins.Players arranged as shown.To begin each drill with ball at one end to get shape and then ball at each end starting at same time. (1) Ball played to player A from 1 who receives and returns.A opens up and receives ball back from 1 to take on back foot and play to end D.A joins D and D plays E to repeat down other side and so on. (2)Ball played from 2 to player B who plays return to 2.B then spins past mannikin.2 plays diagonal pass to straight run of B. 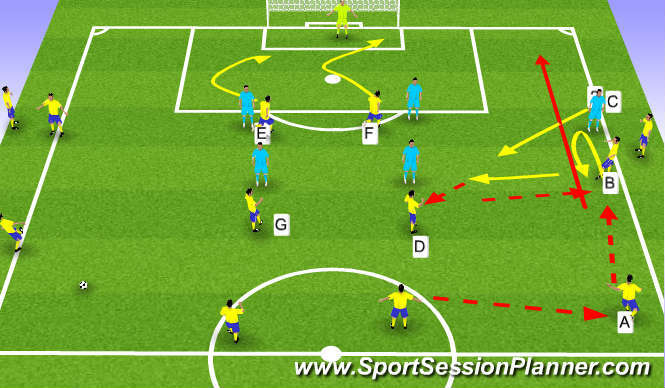 (3)Ball played from 3 to C who plays return to 3.C spins round mannikin but makes diagonal run to receive straight pass from C.
Repeat drills both sides so players use left and right feet to receive. Movement at mannikin to create space. Movement in advance of pass.Quality of touch. (1) 1 plays to A who returns and spins inside mannikin.A plays straight ball,diagonal run from A. (2) 2 plays to B who sets to third man running (3) who plays straight ball for B.2 becomes player on mannikin,3 becomes 2 and plays next pass. (3)4 plays to C who sets to third man running (5)who plays straight ball for C.
(4)Further variation:pass from 5 is diagonal,run from C is straight. One from each team on each side;rest in square .Size of square varied by age/numbers. a)Look to play to same team men on the sides. (A) Unlimited touches at first.Play and receive. d)As above.Two touch only.Outside player must move ball into space quickly when receiving pass. e)Unlimited touches.Now only a 1-2 will get man off line(C).If not on,encourage to keep possession. Further variation:Have players of same team on top and bottom line;players of other team on left and right side lines.Extend area to square area. g)One team plays across,unlimited touch can use end players.Other team plays up and down,unlimited touch,using end players. i)One team plays across,unlimited touch can use end players.Other team plays up and down,unlimited touch,using end players.BUT...must go from one end to other,i.e. can not go back to same side.Working up/down or across right to left/left to rightÂ - Encourage ,receiving on half-turn and playing forward.shape to receive. Then in across and up and down game,can add all variations as listed above ,i.e.taking place,1-2 to get out,vary numbers of touches etc. Create space -movement in advance of ball,movement with ball,movement after playing ball. Work unopposed to get the rhythm, fluidity and timing of the movement patterns. Eventually theses movements should become natural to the players and the triggers should become apparent in matches. Ball played to full-back A.at same time B takes his man (C) up line then returns to collect pass up line from A..B moves across field tracked by C.B plays ball to D who plays ball wide for A to come on to and make forward run to cross ball for E and F.
Once pattern established,work on movements of E and F also.Work both sides. Developments: Centre mid players D or G can spin after making pass and head for box. Developments:D does not have to play A but can feint to do so and play forward. Organisation: Full squad practice as set out above. 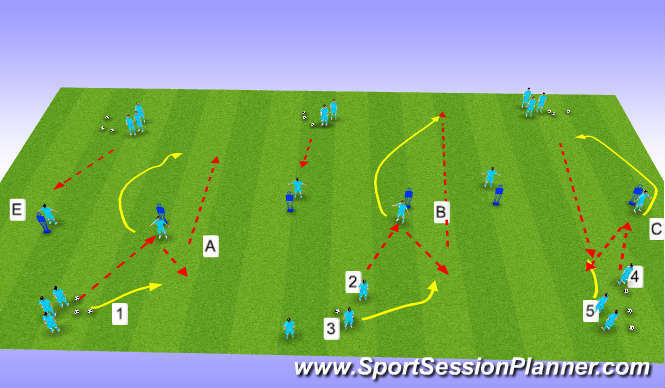 Start with the ball in with centre backs and work both sides. Key Factors: Quality passing on the floor. Timing of Movement. Awareness. First Touch. Communication if required. Quality of cross/shot/finish. â€¢The team in possession must make three passes before allowed to play into attacking half.Player making pass (A) then follows in to attacking half to make 3v3 and support quick play to score.When goal scored or ball lost,player A reverts back to defensive half.Whoever plays ball in to opposite half,joins in. Developments:a) Vary number of passes in defensive half before playing into attacking half. b) Player A must dribble/run ball over line before joining in.